Digging Deep To Find The Goodness In 'Acts Of God' Ellen Gilchrist's bittersweet new story collection is filled with good people who stay strong in the worst of situations — a refreshingly warm-hearted view of humanity that only occasionally cloys. Reading Ellen Gilchrist is addictive. I was first hooked by her 1984 National Book Award-winning story collection, Victory Over Japan. Partly, it's the sassy voice that snares you, and partly it's her tight circle of recurrent characters — feisty, unabashedly sexed Southern women, many of whom are related by birth or marriage. 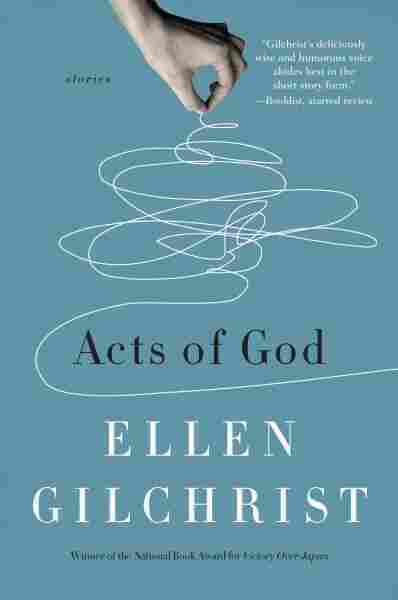 I kicked the Gilchrist habit for a few years, but her new book of ten stories, Acts of God, sent me back to missed installments, including her 2008 novel, A Dangerous Age. One of the most striking changes in her recent work is a focus on disasters that are beyond our control — Sept. 11, Hurricane Katrina, the Iraq war — and how people deal with them. Plenty of bad things happen in Gilchrist's fiction — husbands and fiancés die in terrorist attacks and Iraq, a baby loses his mother and grandmother in a tornado — but her characters rarely perpetrate them. Instead, her new work is filled with good people who show fortitude and even heroism under duress. And while Gilchrist sometimes crosses the line into corny sentimentality, by and large, in this age of edgy irony, her warm-hearted view of humanity is refreshing. Take the five teenagers from the Fayetteville Methodist Church Youth Group who drive south in cold rain to help out after a tornado in "Miracle in Adkins, Arkansas." They rescue a tot buried in the muddy debris when it occurs to a girl who's done a lot of babysitting that where there's a baby stroller, there's probably a small child. In other words, Gilchrist digs through the muck to find the upside of a senseless tragedy. She similarly unearths causes for gratitude in several stories about Hurricane Katrina. In "Collateral," she wants us to admire the unbelievably disciplined widowed mom who uncomplainingly reports for duty as an Arkansas First Responder in the National Guard and spends two weeks rescuing people stranded on rooftops from a helicopter basket — and we do. But she nearly loses our good will with cloying, painfully stilted dialogue and a son and boyfriend who are too good to be true. Gilchrist strikes a more realistic balance in "High Water," in which a gay couple attending a paramedics conference in New Orleans decides to ride out Katrina with an elegant older man they meet while waiting in line at a restaurant. They all end up pitching in at the Tulane Medical Center, carrying invalids to higher floors and breaking into a Walgreen's for desperately needed supplies. Back home in Los Angeles two weeks later, Gilchrist's narrator comments, "What did I learn from my trip to New Orleans? Nothing I didn't already know except that we people are more powerful and quick on our feet than we know and can dig in and get it done if we have to." Writing in her late '70s, Gilchrist is also increasingly focused on exit strategies that preserve dignity and control. After tallying her 14 grandchildren and one great-grandchild, a 78-year-old woman whose multiple sclerosis is progressing thinks, "I've done what I was here for." In her suicide note to her husband she writes, "Nothing is of value except to have lived well and to die without pain." Gilchrist's characters know how to have fun even when under duress, like the group of Southerners who connect while stranded in London's Heathrow airport during a frightening terrorist threat. Narrator Louise Hand, niece of the pivotal Gilchrist character Anna Hand, comments, "Life on the Planet Earth ... Wars and strife and surprises and love and children and art ... This is our parade and I'm marching in it." A Dangerous Age follows Louise's parade route into motherhood. "The Dogs" features another of Gilchrist's perennial alter-egos, the writer Rhoda Manning, who's still irrepressible at sixty-seven. With a volley of riotous letters, Rhoda sparks a pitched battle over a new neighbor's barking dogs which escalates hilariously. The book's title story captures the collection's bittersweet tone. When an elderly couple's caregiver calls to say she'll be late, her resentful 86-year-old charges seize the chance to regain their old freedom — sneaking off in their antique car to buy the real bacon, ice cream, and coffee their minder denies them. The story shares some of the wonderful loopiness of an Alan Bennett tale. And even though by some lights their defiant escapade ends badly, there's a larky joyousness and sense of liberation that can't be squelched. It comes from living life on one's own terms, and it pervades Gilchrist's work.